None of the stories are extraordinary. Many—or variations—of them we’ve come across before, either in our own families or through friends who in turn had heard them from their friends or family. What makes them readable is the sheer sense of fun that imbues the narration. That and the unabashed use of the colloquial and the mother-tongue. The liberal use of Hindi words—as in kinship terms for example—gives the narration a firm setting. It does not float vaguely above an ‘Indian’ landscape bereft of familiar markers that only the mother-tongue can provide. What does ‘aunt’ or ‘uncle’ signify in the face of a ‘bua’, a ‘mausi’, a ‘chacha’ or a ‘mama’? And each item of crockery mentioned—a katori, a chammach, a bhagona—evoke the sights, sounds and smells of a North Indian kitchen. The Glossary makes it easy for those unfamiliar with Hindi to get into the skin of the stories seamlessly. 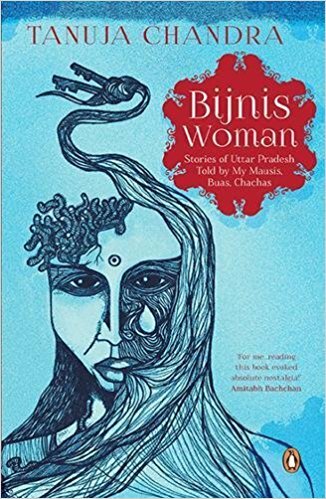 The stories weave tales of a patriarchal society where women subtly manage to get their own way sometimes. But what makes them reverberate in our consciousness are the human emotions that are as old as time itself—greed, pride, love, bravado…And the human archetypes of an orthodox Indian society are equally familiar—the spoilt son who grows up completely self-centred and with a disproportionate sense of superiority; the aggressive little man with an itch to get into brawls; the cruel mother-in-law; the widow who is cursed to live a silent, colourless life; parents who would rather that their daughter were dead than accept her remarriage as a widow; the thakur with a roving eye and its attendant consequences; the girl born with a deformed foot, neglected by parents and shunned by society. They paint a picture of a world in which it is taken for granted that the man can live as he wishes to while the woman must take on the subservient role. It is a raga in which masculinity is the dominant note while the soft feminine notes are oftentimes drowned out in the fury of machismo. But there are the bright moments—the gutsy widow who stages her own death and elopes with a lover, to lead a happy and fulfilled life, is one. Another is the title story which delineates the journey of an ambitious, feisty woman with entrepreneurial skills inspite of her lack of education. It serves to prove that the indomitable spirit comes up trumps every time if only one has enough gumption to go. It is a story of the strength of human character in the face of formidable odds and its ultimate triumph. The book is a breezy read, perfect to while away a short train journey or a rainy afternoon with a cup of the quintessentially Indian masala chai and spicy pakoris. It offers no philosophical solutions to questions of the universe nor any dramatic revelations or insights into human behaviour. What it does is to bring in the genuine, desi flavour to a palate jaded with servings of the Indian urban elite that only a minority can identify with. Related with generous dollops of humour, the book brings to life sepia tinted photographs in old family albums and the essence of a way of life that has gradually disappeared except perhaps in the villages. But while the life style may have altered in substantial ways, a disheartening thought that recurs is that mindsets haven’t really changed all that much even among the ‘sophisticated’, ‘educated’ class, a fact that lends the book an aura of familiarity in spite of its depiction of people and events in a not quite recent past.